Stuart and Diane Kendig welcome you to our website which shows our garden in York Pennsylvania and the daylily introductions created in our garden. Perfect Perennials is a Display Garden for the American Hemerocallis Society so AHS members may call or write to schedule a visit. We continue to sell our introductions and other interesting daylilies on this website. We ship daylilies but encourage people to pick up their purchases as plants sold on our website are potted and established. We have been hybridizing daylilies for 20 years and have developed a line of high performing and cold hardy red edged daylilies. Stuart is also interested in white daylilies and we are very excited about the appearance of broken color stripes in daylilies. If you would like to learn more about white daylilies I have prepared a video for the daylilysociety YouTube channel that you can view here: https://youtu.be/dU2gj9u7CJY We have a small but growing group of daylily gardeners who are participating in an extensive evaluation of white daylilies. Our initial results were published in the Journal. Our goal to promote the creation of great white daylilies for the garden. The world needs some white, hardy, vigorous daylilies. I hope that I can breed some great white flowers. 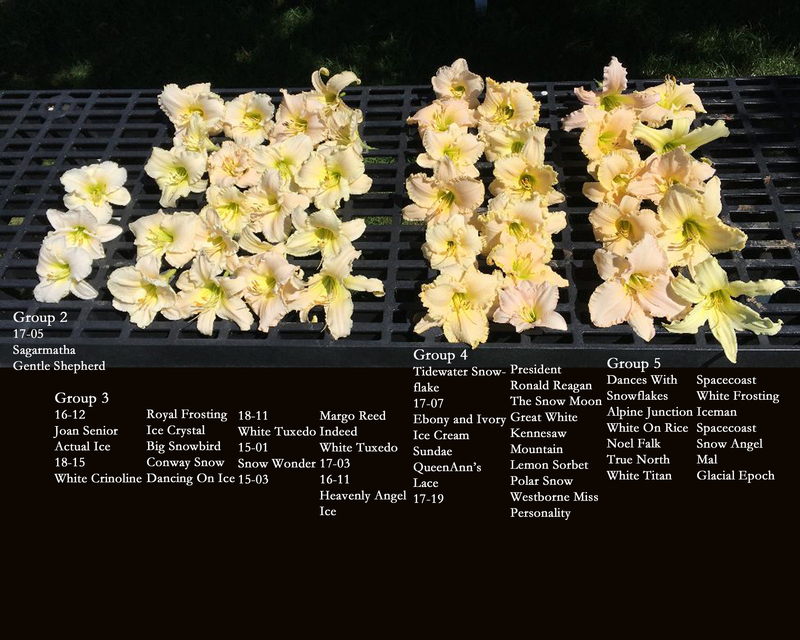 Some daylily friends and I are working to classify white daylily flowers so we can differentiate between the white ones, and the almost white ones. This site has been accessed 1335817 times.